Having been with Beaducation only 3 months, I am the newest member of the customer service team. Callers tell me every week, “You are so lucky to work for such a fun company,” and you know what? They are absolutely right. Because finding the answer to a design stamp question for Mary in Omaha, Nebraska, and figuring out the circumference of a mandrel for Judy in Port Huron, Michigan, allows me to learn right alongside our customers. My first week here, I plunged deep into our warehouse of inventory, where I was quickly amazed by four-sided swivel pendants, ring blanks and design stamps I had never before seen! There where so many items for jewelry making that I wanted one of everything! I explored the Beaducation website and was thunderstruck by how beautiful and easy it was to navigate. 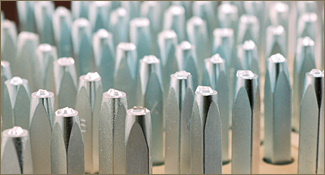 As I moved into customer service, I began to receive the same question from people who were just discovering the world of stamping on metal, “What do I need to begin?” I asked Lisa and Mindy, our webmaster, if they thought it would be possible to compile a user-friendly checklist for beginning stampers. 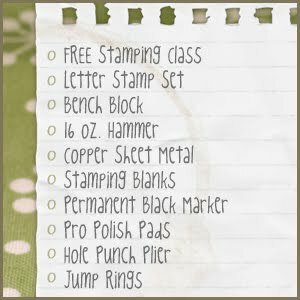 Now, on my 90th day, I get to reveal, our Beginning Stamper Checklist! Let us know what you think. I want to tell Mary in Omaha and Judy in Port Huron to keep those questions coming. And for any of you readers, who wish there was another feature on our site that would help for easier shopping or learning, feel free to e-mail me at mel at beaducation dot com, and we will see if we can make it happen. Thanks Mel...this is just what I needed. Now all we need is a kit with all of these things included...except for maybe the letter stamping sets since everyone may prefer a different font. I agree with Pam, I'd love to see some beginner kits. Thanks for posting this list. I had been thinking of trying to put one together myself--now I won't have to. I agree with the other two commenters that a kit would be a really great idea.